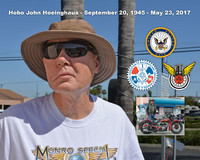 Costa Mesa, Calif. - With great sadness we're mourning the loss of our good friend Hobo John Hoeinghaus whom I've known for 10 years. John passed away on May 23, 2017. He attended nearly every Vintage Bike OC meet, and always helped out. Our deepest condolences go out to his family and friends. A lifelong motorcyclist, Hobo crossed the country many times on his Harley Davidsons back in the 1970's, thus earning his nickname. The first trip was on a mid 1950's model and then several times on his 1972 which I believe has over 250,000 miles on it. He learned his trade as a machinist while serving our country in the US Navy. 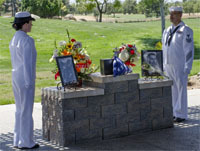 After the Navy he worked as a machinist in Michigan and California. John was a hard worker and often worked 60 hour weeks until he retired. One of John's favorite bikes was his 1931 Indian Scout 101. This bike always gathered attention at our meets. He won Bike of the Month back in April 2013 with his 101. He was a long time member of the Southern California Chapter of the Antique Motorcycle Club of America, www.SoCalAMCA.org, and knew everyone in that community. He would always keep in touch with all his friends like Johnny Eagle and Bob Nichols and visit regularly. Hobo would do anything for his friends and rarely would ask for help from anyone. He attended nearly every meet in the history of Vintage Bike OC and always helped with setup, voting and tear down. His 1931 Scout was always a favorite at our meets. The Memorial Service for John is Tuesday June 13, 2017 at 11:45AM at Riverside National Cemetary. Followed by lunch at a nearby Pizzaria for anyone wishing to attend.